The free zone of Aruba can be used for companies operating in the field of green technology, interested in setting up a regional hub for sales and marketing, R&D and the storage and distribution of components. The macroeconomic policy of the Government of Aruba is strongly focused on attracting, developing and implementing Green Technology. 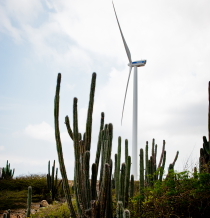 The renowned Dutch research institute TNO has set up a facility on Aruba to test and certify types of renewable energy making use of Aruba’s unique climate and location. A current example of activities relating to Green Technology is a modern recycling facility, where recyclable products are extracted and sold on the international market. The facility can also be used as a showcase for the sale of the technology. Showcasing construction methods highlighting green technology.